Interstate 81 through the Shenandoah Valley is not the friendliest road in the world; it’s far too congested to be entirely safe and should probably be widened to three lanes in both directions from border to border. Still, it runs through gorgeous country of farms and mountains, and it passes towns with names like Grottoes and Mt. Crawford (home of the Green Valley Book Fair) and New Market (site of an 1864 Civil War battle famous for the charge of the Virginia Military Institute’s corps of cadets) and Woodstock. And the billboards for the caverns — Luray Caverns! Skyline Caverns! And Endless Caverns! I have a particular fondness for Endless Caverns. No, I never visited there that I can recall, but they had — and may still have — a Hollywood-like sign of giant letters on the side of the mountain, and I could read the letters on the mountain with my telescope from my house’s carport. I spent a few years of my childhood in the Shenandoah Valley; my father was a librarian at James Madison. We had a house that sat on a hill that faced north into the valley, and it was high enough that you could see for miles and miles. Broadway could be seen easily, and on clear days you could see further north. How far? I was never really sure; even with a telescope features became indistinct. New Market, certainly. Woodstock, maybe. Perhaps even further than that. Driving through the valley on Sunday put me in a nostalgic mood. And because the World Series was happening — Game 5 was that night, as NPR’s news breaks kept telling me — my thoughts turned to baseball. When I was young, my father would take me, my brother, and sometimes my sister to see the Harrisonburg Turks play at Harrisonburg High School’s field. The Turks were part of the Valley League, and they played teams in Winchester, Front Royal, and Staunton, among others in Virginia’s Shenandoah Valley. In total, I think the league had eight teams. I can’t say that I followed the Turks with great enthusiasm — I didn’t know who any of the players were or where they came from — but it was something fun to do, like the time we won a turkey or the time the Turks couldn’t get out of the early innings in a game against Winchester and my dad took us home early. Honestly, after we moved away, I didn’t give the Turks much more thought. I assumed they must have been some sort of minor league team. Years later, I learned they weren’t anything of the sort. The Valley League is a collegiate summer league, and its players are college students (unpaid, because of NCAA regulations) who are playing to refine skills, gain experience, and hopefully catch the attention of major league scouts. 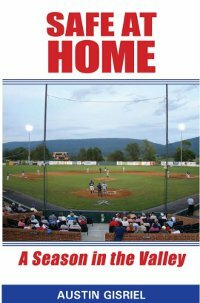 The Valley League, it turns out, is one of the premier collegiate summer leagues in the country, and the league bills itself as “The Gateway to the Majors.” Now the league numbers twelve teams, from Charles Town, West Virginia in the north to Covington in the south and across the Blue Ridge to Charlottesville and Aldie in the east. When I got home, I ran a few Google searches after dinner about the league, and I quickly came across a link on the New Market Rebels website for “Publications” which talked about a book, Safe at Home: A Season in the Valley, about the Rebels’ 2009 season by Austin Gisriel. (If you’re curious, I was looking for something about the league’s history. There’s very little online.) Despite some misgivings — an unknown author, a niche subject, and Smashwords aren’t always a winning combination — the price, just $2.99, was unbeatable, so I decided to give Safe at Home a try. At worst, I would be out three dollars, and I would have to skip the office’s vending machine for a week. Gisriel, a writer from Maryland who discovered by chance the Rebels during a vacation several years earlier, was enchanted by the Platonic ideal of small town baseball — an old time field, a rustic setting, a passionate fanbase, and an emphasis on the game rather than the flashy videoboard and between-innings games — and decided to write a book about the Rebels and the New Market community. I shouldn’t have been reticent about Safe at Home. It’s an enjoyable and interesting book about small town America life (New Market’s population is slightly under 2,000), its passion for baseball, a group of young men who have big dreams, and the community that supports and adopts them. It also helped to contextualize my memories of the Turks; in describing how the teams operate, Safe at Home answered some of my questions about the Valley League and its teams. Plus, the book mentions places that I dimly and distantly remember. Teams operate as non-profits. Coaches are paid, the players are not. Much of the work behind-the-scenes, from maintaining the field and taking tickets to running the concession stand and the radio broadcast booth, is done by volunteers from the community who donate their time to give the players an environment where they can hone their playing skills. Others in the community open their homes to the players and host them for the two and a half months they’re in the valley playing for the team. The players, no matter where they came from, are essentially adopted by the town as more than their hometown heroes. They become family; time and again, the townsfolk refer to the New Market Rebels players as “sons,” and they genuinely mean it in an emotional way. The first third of Safe at Home covers the business side of the New Market Rebels. Beginning with the departure of the players in August 2008, we see the team president and the board of trustees go through the process of hiring a manager for the 2009 season and secure sponsors in the midst of the 2008-9 economic downturn. We meet Mo Weber, a baseball lifer and the octogenarian hitting coach who, in spite of his age, is a lively character and for whom the game is a fountain of youth. We also get insight into how the league operates; time is spent on how the schedule is built as well as the negotiations for an exhibition game in the summer of 2009 against the all-stars of another summer league, the Cal Ripken Collegiate Baseball League in Maryland. Gisriel paints a portrait of the community and its long ties to baseball in these chapters, and we meet some of the fans who will open their homes to the Rebels in 2009. The final two-thirds covers the 2009 season, from the players’ arrival at the end of May through their departure in mid-August. The cast of characters expands greatly at this point, and we discover their stories. We follow them through the trials and tribulations of a 44-game schedule that seems to be beset by everything — fog, rain, hail, poison ivy, a river expedition gone horribly wrong — but plagues of locusts. Some players hope to impress the scouts. Some hope to be drafted. Others discover that their skills are suspect and need work or that their bodies aren’t cut out for the daily grind of 44 games over six weeks. Some suffer major injuries. A few realize they’ve reached their ceiling in baseball and leave the team. We also see a manager, Lucas Jones, who, in his first managerial job, comes in with an attitude and maturity beyond his years and does an impressive job in handling the challenges of his players, the team, and the Valley League. Through it all, we see a group of young men, who were strangers when they started, learn how to come together and become a team. Gisriel avoids the usual cliches of a scrappy, underdog team who finds a way to overcome the odds. This is a chronicle of a real team, not fiction, and the Rebels — like all but one team in every league every year — fall short of their goal of winning the championship. Yet, that doesn’t make the journey any less worthwhile; a group of young men learned something about themselves in the pursuit of their dreams, and a farming town in the Shenandoah Valley found a new group of local heroes for the summer and let them into their hearts. Safe at Home may not have been perfect — it has a few flaws, which I’ll cover below — but it was good enough to win me over and recommend it. Gisriel paints a wonderful portrait of baseball in small town America and the communities that support it. If you’ve any interest in young baseball players and their quest to achieve their dreams, Safe at Home is a good story, one that’s well told and worth your time. Think of this as an appendix. Safe at Home, which I want to stress I enjoyed greatly, has a few flaws, some of them technical, some of them narrative. I wouldn’t say these flaws are reason not to buy and read the book, but I wanted to note them and explain my thinking. 1) Presentation. I’m picky when it comes to ebooks. I want something that resembles a book in its layout rather than a webpage. I want indented paragraphs and no double-spacing between paragraphs. Safe at Home is laid out like a webpage — paragraphs are double-spaced and not indented. Plus, the ebook hyperlinks to a gallery of pictures taken that season of Rebel Field, the coaches, the players, and the community; it would have been nice to have those pictures integrated into the text rather than as a separate thing so that as one is reading they can see what’s being described. (It’s a wonderful gallery of pictures, by the way, but they’re on a private Picasa link so I’m not going to share that link.) However, I also recognize that the pictures probably aren’t in the book for clearance reasons; some of the subjects might not want their pictures in a book. Update: This “flaw” isn’t a flaw any longer. To make a long story short, I began tinkering with the eBook using Calibre and fixed the book’s formatting problems, turning it into something that was, in my opinion, “felt more like a book.” I sent Austin Gisriel a copy of the “fixed” ebook for his own use, and he wanted to know how difficult it would be to update the file readers would download. That took a little more work; I had to learn how Smashwords worked, for one thing. I had a lot of fun working on this, and I was glad to work on it; I liked this book, believed in this book, and thought people should read it, and nothing turns a reader off more than a poorly presented ebook. Thankfully, Austin was extremely happy with the result, and I hope readers are, too. 2) Dramatis personae. There’s a large cast of characters in the book and, frankly, I had a little difficulty keeping some people, especially the players, straight. A list of the characters in the book — and for the players, their hometowns, colleges, and positions — would have been useful. 3) Building the Rebels. One of the jobs of a manager in the Valley League, we’re told, is to recruit the players. This happens off-page. We’re told that Jones is going to recruit the players, and then they show up in May on reporting day. How did Jones recruit the 2009 Rebels? What qualities was he looking for in a player? Were some of the players recruited by other teams in the Valley League or other collegiate summer leagues? What made players choose the Rebels, especially if they were recruited by other teams? Some insight into the process of finding and signing players would have been welcome and, I think, enhanced Safe at Home. 4) The New Market community. Once the players report and the season begins, Safe at Home leaves the town behind to focus on the game and the players. We have a few glancing looks at the town during the Fourth of July festivities, and the fans are mentioned a few times in the course of the narrative, but in many ways we lose the connection between the Rebels and the town, and what connection we do have feels like it’s told rather than shown. Safe at Home spends a chapter on Mo Weber for good reason; he’s an important part of the Rebels story. A chapter that spent time with the fans and showed how the town felt about the season, especially when the Rebels struggle out of the gate, wouldn’t have been out of place because the fans, too, are part of that story. 5) Politics. The summer of 2009 was the summer of the rise of the Tea Party and the summer after the economic collapse of autumn 2008 and Obama’s election. The Shenandoah County is a very conservative area; it voted strongly for John McCain in 2008 and Mitt Romney in 2012. Except for some struggles to find sponsors for the 2009 season, you wouldn’t have any sense of the economic and political environment in which Safe at Home takes place. What did the community feel in the summer of 2009 about the recession and the political moment? What did the players feel? Did it affect the team? How did the market affect the community? There’s an interesting story about the United States that’s taking place off-page, and it feels conspicuous by its absence. I seem to have gone into the book’s flaws at greater length than I’d intended. It’s the soul of the editor in me; all save the first would have been my editorial notes on the manuscript (the first is the province of the publisher), and I can see good reasons why these, especially the fifth because of its contentiousness, weren’t a part of Safe at Home. The fact that I gave the book this much thought shows how engaged I was with it; I enjoyed what I was reading, and I wanted it to go just a little further. To reiterate, in spite of any misgivings I had or any flaws I found, Safe at Home is worth your time if you’ve any interest in baseball in small town America. Buy Safe At Home: A Season in the Valley for your ereader from Amazon, Barnes & Noble, or Smashwords.